When it comes to writing students are most often heard saying "I don't know what to write about!" Just Add Words helps your students get past this hurdle and lets them practice the skill of writing by giving them a picture prompt to get them started. Let your students add their own creativity by finishing the picture or adding creative details to help make their story come to life. Perfect for an independent writing center, Work on Writing Time or whole class instruction. 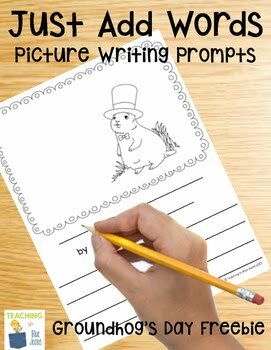 The picture prompts included in this packet work perfectly with a variety of writing styles: persuasive, narrative, opinion, expository, and creative writing. In this download you receive 2 groundhog picture writing prompts perfect for Groundhog's Day. Each of the picture prompts is provided on a page with primary lines and standard single lines. This makes it perfect for your beginning writers and those that are more advanced. I have also included a full page of writing lines (primary and standard) for those budding authors that have lots to say! Follow my store for more Just Add Words packs and other ready to use instructional resources!